The start of the sheep year is Autumn when the shepherd checks through his flock to ensure the ewes are ready and fit to meet the ram. This is the time when feet are trimmed and udders are checked. Excess ewes are sold and replacements bought. This is the time of year for sheep fairs and auctions and historically movements of sheep about the country. The production of breeding sheep has traditionally focussed on the harsh conditions of the North of England. Many lowland sheep were either born in the North of England or at least their mothers were. Our flock is no exception the nucleus being North of England Mules, which are in fact the most common sheep in the country. The mule, itself a crossbred, is hardy, a brilliant mother, and very intelligent. Our mules came to us as lambs from Yorkshire, spend their first winter growing and learning the language, before being introduced in their second autumn to Texel Rams. The best of their daughters are retained for breeding and form the larger part of our breeding flock known as Texel - Cross. The shepherd will also have spent some time checking through his rams and if necessary bought in new rams in time for tupping. The traditional date for introducing the rams to the ewes is November the 5th, following that the first lambs will be born on April the 1st. In the days when we ran a larger flock, once the rams came out of the flock we moved the ewes to Wellcombe Bottom in Hurstpierpoint and onto Wolstonbury Hill, where they enjoyed the magnificent views north up to the Hogs Back and round to the North Downs, and appreciated the herb-rich chalk grassland. Their hardy parents and their knowledge of where to get out of the wind ensured they could thrive on the hill. Now we run a smaller flock the ewes don't need to leave the farm. About a month before lambing the ewes are brought into the lambing shed to be cosseted with hay and home-mixed cereal ration. With extra help at lambing time the ewes can be watched and assisted if necessary. As soon as the ewe has settled down with her lambs she will move across to a mothering up pen with other ewes and lambs. After two weeks inside with her lambs she will be allowed back out onto grass, where if the weather is kind the grass will grow and she can feed her lambs. 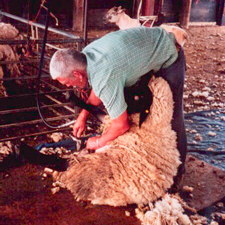 Summer is shearing time, we generally shear in June. They might be reluctant at first, but when the temperature soars they are visibly relieved to be out of thier winter coats. When it is warm and damp sheep farmers face problems with fly strike, we have to keep a close eye on the ewes and lambs so that we can deal with any cases before they get serious. Lambs will stay with their mothers until weaning time in July, by which time the lambs will look almost as big as their mothers and two lambs feeding will lift their poor mother clean off her back legs. After they have been separated the ewes have a well deserved rest of a couple of months before the cycle starts again when they once again meet the rams. In 1998 the farm was entered into the Countryside Stewardship Scheme. Under the scheme some arable fields have reverted to traditional grassland and others have a 6m grassland margin. Many of the hedges had become leggy and overgrown, over a period of 10 years we have been coppicing and planting up gaps in hedgerows and in some cases laying the hedges to bring them back to useful condition. Hedges with plenty of bottom are the most beneficial for small mammals and invertebrates. Even after a couple of years the improvements are noticeable, larger numbers of little owls and kestrels are found hunting along the hedge rows, and in recent years kestrels and barn owls have been making use of our nesting boxes. Grass snakes are seen more frequently. Water features always attract wildlife. We have been able to clean out and improve six old farm ponds. The larger pond has a growing number of fish which attract the attentions of a pair of herons. Mallard and moorhen nest on the island. In the winter months snipe will always be found in the wetter parts. Every year we take a trip around the bird boxes, at the beginning of January, to clear out any unwanted debris usually left by squirrels taking up residence. 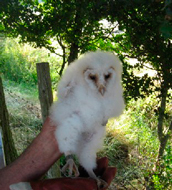 In 2011 we were thrilled to find two boxes each having a barn owl roosting in them. We assumed they were male and female, but as the boxes were 500 metres apart romance was not assured. However they clearly got together. When the experts made an inspection 3 chicks and an egg were found. The summer had some bad spells that made hunting pretty difficult and at the end of the summer only the biggest chick survived. He's pictured here proudly showing his new ankle ring. The same year two pairs of Kestrels took up residence in boxes at each end of the farm. In July Reg and Brian came to check on the two clutches of 3 chicks. 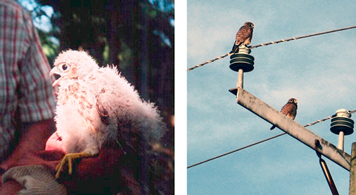 These were also ringed and one is pictured here, as a fluffy chick (albeit with a threatening beak and deadly talons) and again four weeks later, surveying the land from the vantage point of an electricity pole with its fellow nestling. By this time they had become accomplished flyers, although still dependent on their parents to bring them food, but they didn't stray far from the security of their nest box; at dusk they would usually roost in the tree that contains the box. So both Kestrels and Barn Owls have bred successfully; as well as providing nesting boxes, we clearly have good habitats for voles which form a significant part of their diets.